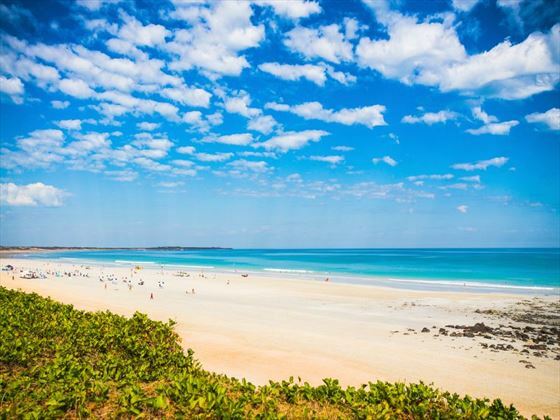 Arrive in Broome and be transferred to your hotel, the Cable Beach Club Resort & Spa. Enjoy your day at leisure to explore this fascinating place. Head to the Sunset Bar and Grill at your resort to see one of Australia’s best sunsets over Cable Beach. This evening, enjoy a Welcome Dinner before your fascinating journey commences. Today you’ll journey on the Gibb River Road to visit the picturesque Windjana Gorge where cliffs tower above white glistening sands. Admire the ancient marine fossils embedded in the gorge walls and scour the banks for a glimpse of the freshwater crocodiles that laze on the shores of the Lennard River. Continue to Tunnel Creek, a 750-metre-long natural tunnel carved through the Napier Range, located in the Dimalurru Tunnel Creek National Park. With torch in hand, wade through the cool waters that fill the tunnel’s winding path underground and emerge on the other side to the sight of a stunning oasis. Travel into the Wilinggin King Leopold Range Conservation Park. Covering more than 900,000 acres and featuring seven rugged ranges. Arrive at the first of three APT lodges, Bell Gorge Wilderness Lodge, which boasts an enviable position and a sprawling lawn to relax. Your tented cabin the perfect spot for you to enjoy the beauty of this ancient land from your private deck. Back on the Gibb River Road, travel to Bell Gorge, where stunning cliffs surround a series of tiered waterholes. Sitting approximately 300 metres above sea level, Bell Gorge is an idyllic natural spot for swimming and photography. Enjoy a spot of bird-watching or perhaps hike to the lower pool of the gorge and enjoy a relaxing dip below the cascading waterfall if you are feeling adventurous. 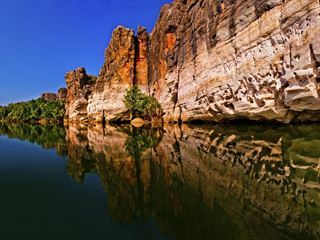 Travel through the heart of Kimberley cattle country to discover the secluded gorges that the region has to offer. At Galvans Gorge, perhaps take a leisurely swim or simply relax in this veritable oasis. 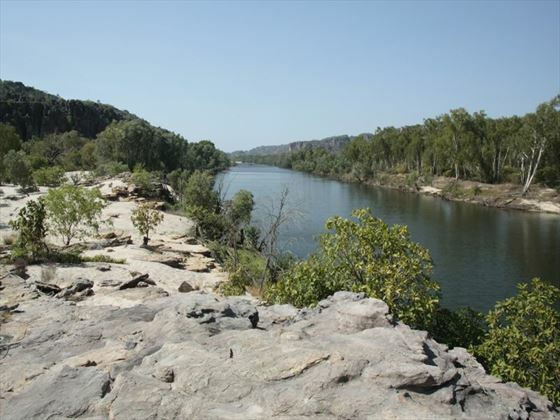 Carry on to the beautiful Manning Gorge, where you will enjoy lunch before taking the Kalumburu Road to Drysdale River Station, an historic cattle station. Ascending the Mitchell Plateau today, you’ll explore the Wandjina and Bradshaw (Gwion Gwion) rock art galleries and swim in the clear waters of the King Edward River. For the next two nights, you will stay at APT’s wilderness accommodation, in a unique location at the top of the plateau, set amongst Livistona palms. Enjoy the facilities of the lodge’s Ungolan Pavilion, relax in the lounge, sip a drink whilst reading up on the fascinating local history and culture. In the heart of the Mitchell Plateau, your accommodation is perfectly positioned beside the Pandanus-fringed Camp Creek, where you can enjoy a refreshing dip. Today, discover Mitchell Falls’ beautiful cascading waters and Indigenous rock art on a walk. When available, local Indigenous guides will join you to provide insight into the stories that the rock art and landscapes tell. Start the day with a guided hike to Little Mertens Falls and view rarely seen rock art. Carry onto Big Mertens Falls to see the fantastic Mitchell Falls at their best with an included helicopter flight. Should you prefer, hike back with your guide (longer helicopter flights are also available at an additional expense). On day eight you’ll rejoin the iconic Gibb River Road and ford the Durack and Pentecost rivers. Don’t be deceived by the tranquil the waters of these rivers as saltwater crocodiles inhabit these waterways. Continue on to El Questro Wilderness Park, an incredible cattle station come nature reserve covering a staggering 700,000 acres right in the heart of the Kimberley. Spanning 80 kilometres from north to south and 60 kilometres east to west, much of this remote wilderness is unexplored. Stay two nights in tented accommodation at the foot of the Cockburn Ranges, immersed in nature at Emma Gorge Resort in the heart of the wilderness park. Explore this beautiful setting, take a refreshing swim in the resort pool or relax on your private balcony to soak in the beauty of the Cockburn Range at sunset. Later, delight in a sumptuous dinner at your resort. Continue to discover the amazing wonders of El Questro Wilderness Park on your second day here. This morning head to the beautiful Zebedee Springs, a permanent natural thermal spring tucked away in a secluded part of rainforest. Soak in the hot springs and relax. Enjoy lunch at The Station and after join a local ranger to embark on a cruise along the stunning Chamberlain Gorge, a fresh waterway lined by tropical vegetation and rugged escarpments. Return to Emma Gorge for an afternoon hike and take in the serene setting at sunset before a sumptuous dinner back at the resort. Journey deep into Word Heritage-listed Purnululu National Park, home to some of the country’s most striking geological formations. 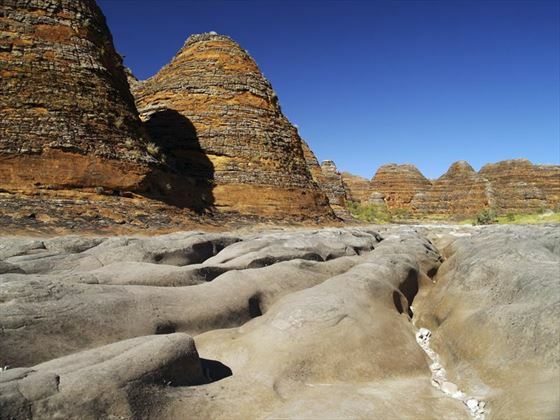 The park is home to the famed black and orange striped domes of the Bungle Bungle Range. You will travel the Spring Creek Track then hike to the awe-inspiring Echidna Chasm, a spectacular natural cleft in the rock. Narrow in width with walls reaching 100 metres high, Echidna Chasm is a must-see in the Kimberley. Your journey continues on to APT’s award winning Bungle Bungle Wilderness Lodge, located in the heart of the serene Purnululu National Park. Tonight, enjoy a dinner in the open air restaurant and be amazed by the sense of remoteness. 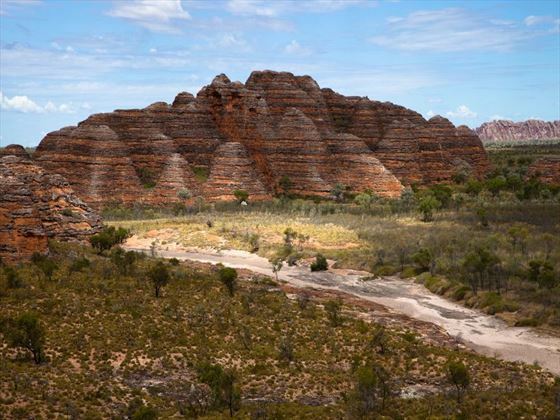 Explore the magic of Purnululu and discover the depth of the Bungle Bungle Range. Walk along Piccaninny Creek as it winds through the high walls of the Bungle Bungle domes. Marvel at the majestic beehive domes as your guide brings the natural history of the range to life. Your next stop is the natural amphitheatre of Cathedral Gorge, a spacious cavern reaching skyward, where the acoustics are astounding. An optional scenic helicopter flight over the range is available (own expense). This evening, enjoy sunset drinks over the Bungle Bungle massif. Travel through rugged red landscapes to Kununurra, the gateway to eastern Kimberley. Home of the Ord River Scheme, an engineering feat designed to prevent seasonal flooding and to store water for irrigating large areas subject to drought. Settle into Kununurra Country Club Resort and enjoy dinner later this evening. Travel to the majestic Lake Argyle, the largest man-made lake in the Southern Hemisphere. 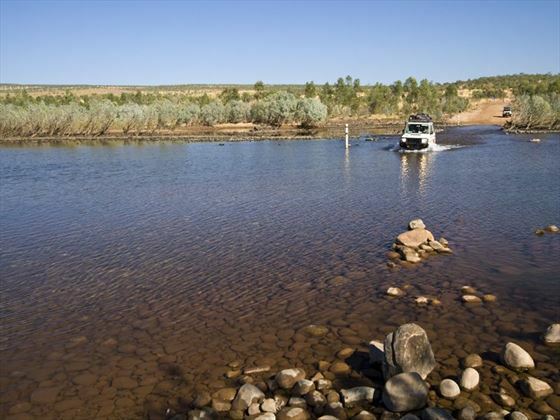 Here you will join a spectacular wildlife cruise on the mighty Ord River. 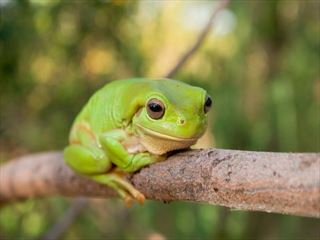 Discover the fascinating ecological system that has developed from the damming of the Ord River, creating an area rich in wildlife, flora and fauna. This evening enjoy dinner at your resort. Today you will cross the border into the Northern Territory on the way to Nitmiluk National Park. This evening, enjoy canapes and drinks on arrival at the beautiful Cicada Lodge, before indulging in a superb dinner showcasing the region’s finest produce. 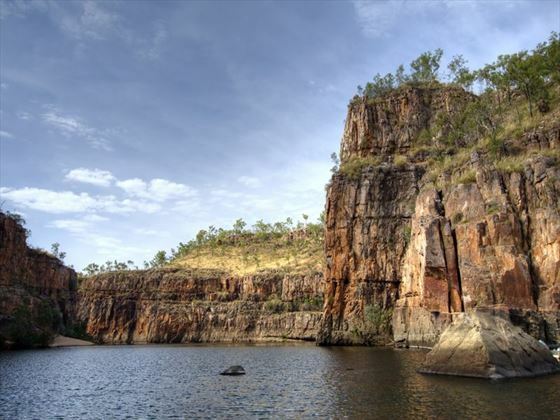 After breakfast, step aboard the unforgettable Nitmiluk Gorge Cruise. Discover the music, stories and ways of the local Jawoyn people. 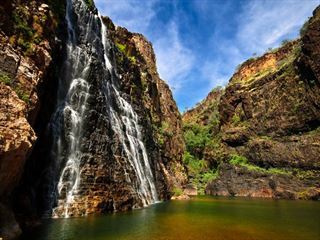 Travel to Kakadu to marvel at the flora, wildlife and beautiful scenery in Australia’s largest national park. Enjoy a cruise on the Yellow Water Billabong to see the spectacular landscapes and rich wildlife. Then travel onwards to Noirlangie Rock within Kakadu to view the unique Indigenous rock art. Tonight, enjoy dinner as you take in the beautiful surrounds of Hawk Dreaming Wilderness Lodge. Accompanied by a local guide you will cross the East Alligator River into the magical and spiritual Arnhem Land. Discover the ancient art and natural beauty of this region which is normally inaccessible to most guests. This afternoon, return to Kakadu to enjoy the art and billabongs of Cannon Hill and Hawk Dreaming (Arnhem Land may be inaccessible for cultural reasons or when tides prevent the crossing of the East Alligator River). 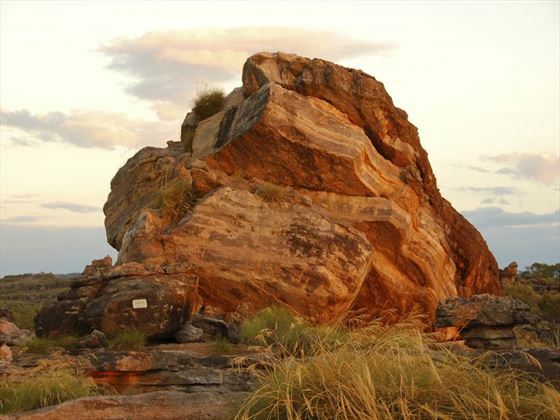 Today visit the sacred site of Ubirr and explore the galleries of ancient Indigenous rock art. The magnificent rock faces have been continuously painted and repainted since 40,000BC, with most created approximately 2,000 years ago. Later, you will travel to Darwin and indulge in a Farewell Dinner with the group. After breakfast you will transfer to Darwin airport for your onward flight. The activity level on this tour is Active as it includes some longer, more challenging hikes over uneven terrain.